Taste test: These are very crunchy chips with a nice jalapeño taste to them. 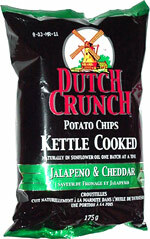 It's not the strongest heat among jalapeno chips, but it has a good afterkick, and the heat lingers for a while. The underlying kettle-cooked chips are excellent, with a great texture and a great crunch. Smell test: Just a regular potato chips smell.